If you want to make screenshots and just save them locally, say for further editing, you can configure this in the configuration panel (presented at 1.15 version). You can save the screenshot and upload it later. 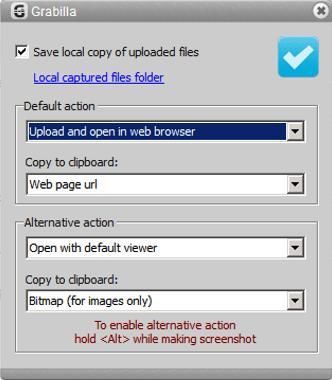 Check on Save local copy of captured files checkbox. Then set Default action to None (so image won’t be uploaded), and Copy to clipboard to None too (you can choose some other option if you wish). Remember that when the image won’t be uploaded to our server, a link to internet image can’t be copied to clipboard, you can copy only local path to the image to clipboard. You can upload local captured images with Drag-and-Drop upload feature later. Grabillas are saved to c:\users\%username%\AppData\Local\Grabilla folder. You can copy this link and paste it into Windows Explorer. Can Grabilla capture an entire screen – including the scrollable portion that is not displayed until scrolled? Currently Grabilla can’t make screenshots of entire web page, it can capture visible part only. You can try Grabilla Web Capture extension for Chrome, it can capture web pages, entire or part and save them as originals. Check 1.23 version or Grabilla Chrome extension. Both can capture entire screen. 1) it only saves on my computer several folders deep–I created a folder that I want to save to but it will not allow me to save there. after I have captured an image or video if I navigate to the folder of choice–the image is not there it just goes away. How do I set default save folder? 2)I hit enter key such as typing now but grab window opens–how do I stop it? 3) at the bottom of the window how do I stop it from saying “upgrade”?? its the latest download–I need to make upgrade message go away. 1. Right now, you cannot change the folder where to save grabillas. They are located at c:\users\%username%\AppData\Local\Grabilla folder. You can add a shortcut to this folder to your desktop for faster access. Please make sure that you have Save the local copy checkbox checked in preferences. 2. Check Grabilla launch hot key settings in preferences. 3. Sorry, in current version banner can not be removed, but you can ignore it.